Now that I’m in Lebanon, I can tell you about entering. 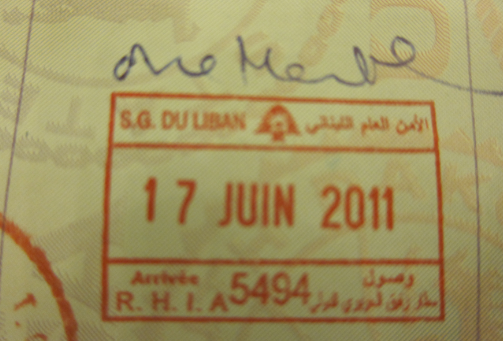 Upon arriving in Beirut, I was asked to fill out the visa information. Not knowing the address of the hotel, (Calvin had made the reservations and was coming in on a later flight) I left that part blank. Passport control was not happy. I explained my situation to the woman behind the counter and she called over some guy. He just shook his head and said something in Arabic. She stamped my passport. But then they gave me a little hell. This continues back and forth for a few minutes. Finally I offer to write down Calvin’s flight info so they can track him down. Some people, I think would have seen this as a cause for worry. What if Calvin breezed on by security and ended up waiting for me in the wrong area again? I saw this as a chance to wait for Calvin’s flight in a cushy chair rather than standing in a crowd outside arrivals. So I settled in with a magazine. Maintained my calmness. Put my ankle up on my knee and started reading about motorcycledomes in the 1930s. About 15 minutes later, a guy walks by and his trousers brush up against the bottom of my propped up foot. I pack up my stuff and walk out of the office. Passport control is totally empty. I peruse some duty free candy on the way out (giant toblerone. 10 dollars.) and wait for Calvin outside of arrivals. Calvin: "Steph went to Lebanon and all she got was this and a stupid t-shirt."